Avadea Covill [Avudaiyarkoil]. Pyramidal gateway and porch at entrance to sanctum. bl.uk > Online Gallery Home	> Online exhibitions	> Asia, Pacific and Africa Collections	> Avadea Covill [Avudaiyarkoil]. Pyramidal gateway and porch at entrance to sanctum. 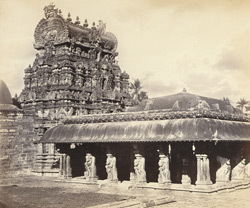 Photograph of the Avudaiyarkoil Temple from the 'Photographs to Illustrate the Ancient Architecture of Southern India' collection, taken by Edmund David Lyon in c. 1868. Avudaiyarkoil is approximately 45 km south-east of Pudukottai in Tamil Nadu. The Nayanar poet-saint Manickavasagar is believed to have founded the temple in the 8th century under the Pandyan dynasty, but its present form mostly dates to the 17th century. The temple is noted for its granite roof-work and is dedicated to the worship of Shiva. This photograph is a view of the inner court of the temple, in front of which is the mandapa (columned hall). The small pyramidal tower can be seen over the entrance to the sanctuary. The elaborately carved pillars and the roof of the porch are of the same hard dark stone.